Soaring Eagle Poker Room is open 24 hours, 7 days a week and offers a smoke-free environment. Games include: Texas Hold’Em, Pineapple, Crazy Pineapple, Omaha, Seven Card Stud, Razz and multi-game formats. For example: Round by Rounds, Dealers Choice, HORSE, SHOE and HOP. Players may request any game type with any limit. Contact the Soaring Eagle Poker Room at 989-775-5198. Three main jackpots are in on the action for Hold’Em, Omaha and 7 Card Stud. If your qualifying poker hand is beaten by a better hand you can win!!! Enjoy a reduced rake from 6AM to 12PM. Attention Poker Players! 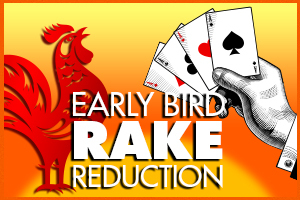 Enjoy a reduced rake from $5 to $3 for all games, every day from 6AM to 12PM. It’s our way of rewarding our early birds who like to catch the worm and those pocket aces! *Please visit the Poker Room for complete Rules & Regulations. Management reserves the right to change or cancel this promotion at any time. 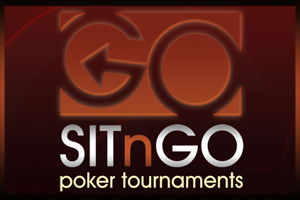 Sit N Go’s are single table tournaments in which each player is competing against all other players at a specific table for the entire tournament. Buy-in totals are available for $40, $60 & $100 plus a $15 seat fee. Please visit the poker room for further details and official rules. $200 Buy-In Fee, $25 Seat Fee, Optional $15 Dealer Add-On. Registration opens at the conclusion of the prior month’s tournament. Tournaments are limited to the first 140 active players. The total amount of players in the tournament may exceed 140 due to re-buys or late buys if there are open seats during the late buy period. Participants will receive 25,000 in tournament chips at the start of play. Those who purchased the optional $15 dealer add-on will receive an additional 5,000 in tournament chips. Chip stacks will be subject to blinding out. Tournament begins at 10:30AM Late registration permitted until the beginning of round 5 if seats are still available. If a participant is eliminated from play during the first 4 rounds, the participant may re-buy into the tournament if seats are still available. If a participant re-buys back into the tournament. The $200 buy-in and $25 seat fee must be paid in full. The $15 dealer add-on is still optional. Players buying in late or re-buying will be given a full starting stack. If the tournament is full and there are still other players wanting to play, an alternate list will be kept and seats will be assigned to players off the list on a first come, first served basis once they have opened. If a player busts out of the tournament, that player will have the option to re-buy before the seat is given to a player from the alternate list. Participants must pay in person at the cage in the poker room and must show valid picture I.D. and Players Club card at time of registration. Receipt can be turned in on the day of the tournament ½ hour prior to the posted tournament start time for tournament chips and to draw for seat placement, if not already established. Must be a SECR players club member 18 years of age or older in order to participate in tournament. No refunds or exchanges without approval from tournament officials. Proceeds from the optional $15 dealer add-on will go to the dealer tip pool. Optional $15 dealer add-on must be purchased when paying full buy-in fee. Only one optional $15 dealer add-on per paid tournament buy-in. Participants must leave all chips in open view of other players and tournament officials at all times, keeping their higher denomination chips in front. Chips in play, average stack size, and remaining tables and players will be posted and updated throughout the tournament. Participants must play out the tournament down to the last player. Split pots are not allowed. Chips cannot be transferred. All forfeited chips will be returned to tournament officials. Tournament officials reserve the right to call time and stop play. Tournament officials reserve the right to combine tables as necessary. Players will be seated by random draw from the eliminated seats when breaking down a table. Otherwise players will be placed as close to their original position as possible. 65-140 entries: 1 = 38%, 2 = 21%, 3 = 13%, 4 = 8%, 5fi= 5%, 6 = 4%, 7 = 3.5%, 8 = 3%, 9 = 2.5%, 10th = 2%. 26-64 entries: 1st = 45%, 2nd = 25%, 3rd = 15%, 4th = 10%, 5th = 5%. 25 entries and less: 1st =50%, 2nd = 30%, 3rd = 20%. Tournament official’s decisions are final. $350 Buy-In Fee, $35 Seat Fee, Optional $15 Dealer Add-On. Participants will receive 30,000 in tournament chips at the start of play. Those who purchased the optional $15 dealer add-on will receive an additional 10,000 in tournament chips. Chip stacks will be subject to blinding out. Tournament begins at 10:30AM Late registration permitted until the beginning of round 5 if seats are still available. If a participant is eliminated from play during the first 4 rounds, the participant may re-buy into the tournament if seats are still available. If a participant re-buys back into the tournament. The $350 buy-in and $35 seat fee must be paid in full. The $15 dealer add-on is still optional. Players buying in late or re-buying will be given a full starting stack. If the tournament is full and there are still other players wanting to play, an alternate list will be kept and seats will be assigned to players off the list on a first come, first served basis once they have opened. If a player busts out of the tournament, that player will have the option to re-buy before the seat is given to a player from the alternate list. Participants must pay in person at the cage in the poker room and must show valid picture I.D. and Players Club card at time of registration. Receipt can be turned in on the day of the tournament½ hour prior to the posted tournament start time for tournament chips and to draw for seat placement, if not already established. Tournaments are limited to the first 120 registrants (including late registrants). Participants will receive $5,000 in tournament chips at the start of play. Those who purchase the optional $5 dealer add-on will receive an additional $1,000 in tournament chips. Registration opens at the conclusion of the prior week’s tournament. The tournament begins at 12:30 P.M. Late registration is permitted until the beginning of round 3 if seats are still available. Ifa participant is eliminated from play during the first 2 rounds, they may re-buy if seats are still available. If a participant re-buys, the $50 buy-in and $10 seat fee must be paid in full. The $5 dealer add-on is still optional. Players buying in late or re-buying will be given a full starting stack. Participants must register with a valid photo I.D. and SECR Players Club card and pay in person at the poker room cage. Your receipt can be turned in at I 2:00 P .M. to receive your tournament chips and to draw for seat placement (if not already established). No refunds or exchanges are allowed without approval from the tournament officials . Proceeds from the optional $IO dealer add-on will go to the dealer tip pool. The optional $5 dealer add-on must be purchased at the time of registration. Only one optional $5 dealer add-on per paid tournament buy-in is allowed. Participants may play out the tournament down to the last player or, if unanimously agreed upon by all remaining players, may split the remaining tournament payouts as they wish. SECR and the Poker Room staff hold no liabilities in the matter of a split. Chips cannot be transferred. All forfeited chips will be returned to tournament officials. 65-120 entries: 1st = 38%, 2nd = 21%, 3rd = 13%, 4th = 8%, 5th = 5%, 6th = 4%, 7th = 3.5%, 8th = 3%, 9th = 2.5%, 10th = 2%. The tournament official’s decisions are final. Participants will receive $5,000 in tournament chips at the start of play. Those who purchased the optional$5 dealer add-on will receive an additional $1,000 in tournament chips. Tournament begins at 6:30 PM. Late registration permitted until the beginning of round 3 if seats are still available. If a participant is eliminated from play during the first two rounds, the participant may re-buy into the tournament if seats are still available. If a participant re-buys back into the tournament the $50 buy­in and $10 seat fee must be paid in full. The $5 dealer add-on is still optional. Players buying in late or re­buying will be given a full starting stack. Proceeds from the optional $5 dealer add-on will go to the dealer tip pool. Optional $5 dealer add-on must be purchased when paying full buy-in fee. Only one optional $5 dealer add-on per paid tournament buy-in. Registration opens at the conclusion of the prior week’s tournament. Tournament begins at 6:30PM. Late registration permitted throughout the first 2 rounds if seats are still available. Participants must pay in person at the cage in the poker room and must show valid picture I.D. and Players Club card at time of registration. Receipt can be turned in ½ hour prior to the posted tournament start time for tournament chips and to draw for seat placement, if not already established. Participants will receive $500 in tournament chips at the start of play. Participants who purchase the optional $2 Dealer Tip Add-On will receive an additional $500 in tournament chips at the beginning of play. If a registered participant arrives late and has been completely blinded out they are not entitled to a refund although they may purchase a re-buy if they have been eliminated before the first ten minute break. If the participant arrives after the first ten minute break and is completely blinded out, they are eliminated. Proceeds from the optional $2 dealer add-on will go to the dealer tip pool. Optional $2 dealer add-on must be purchased when paying full buy-in fee. Only one optional $2 dealer add-on per paid tournament buy-in. This Add-on not available on Re-buys. Unlimited re-buys through the fifth round. $1,000 in tournament chips can be purchased for $10. Re-buys will be done at the table. Please use casino chips to purchase re-buys. Cash will not be accepted at the tables. When re-buying a player cannot exceed a $3,000 tournament chip count. A re-buy can not put your chip stack over $3,000 in tournament chips. Payout is based upon a percentage of the prize pool which is 100% of all initial buy-ins, 85% of all re-buys and add-ons (10% will go to the house and 5% will go toward the dealer tip pool). Based on percentage of prize pool $3,001 and up: 1st = 38%, 2nd = 21%, 3rd = 13%, 4th = 8%, 5th = 5%, 6th = 4%, 7th = 3.5%, 8th = 3%, 9th = 2.5%, 10th = 2%. Based on percentage of prize pool $1,501 - $3,000: 1st = 45%, 2nd = 25%, 3rd = 15%, 4th = 10%, 5th = 5%. Based on percentage of prize pool $0 - $1,500: 1st = 50%, 2nd = 30%, 3rd = 20%. Tournament begins at 6:30PM. Late registration permitted until the beginning of round 3 if seats are still available. If a participant is eliminated from play during the first 2 rounds, the participant may re-buy into the tournament if seats are still available. If a participant re-buys back into the tournament the $35 buy-in, $5 seat fee and the $25 bounty must be paid in full. The $5 dealer add-on is still optional. Players buying in late or re-buying will be given a full starting stack. Participants will receive $5,000 in tournament chips at the start of play. Those who purchased the optional $5 dealer add-on will receive an additional $1,000 in tournament chips. When a player eliminates another player from the tournament, that player who had the winning hand will be awarded a $25 SECR value chip from the tournament official. Players do not have to keep their Bounty chips on the table, as they are not in-play during anytime of the tournament. In the event of multiple pots in a single hand (side pots), a player will receive the bounty for the person they are responsible for eliminating. If two or more players split a pot which results in the elimination of another player, the bounty will be awarded to the player who has the bigger tournament chip stack (if tournament chip stacks are identical the bounty chip will be awarded to the player in worse position). If two or more players split a pot which results in the elimination of more than one player, the bounty chips will be split evenly between the winners of the hand, with any odd bounty chip going to the player with the bigger tournament chip stack (if tournament chip stacks are identical the bounty chip will be awarded to the player in worse position). The winner of the tournament will also receive the bounty chip which represents them . Players may not use their Bounty chips to negotiate with other players during any hand throughout the course of the tournament. This will result in a time out penalty or disqualification from the tournament. If a player is disqualified or forfeits from play, the bounty chip which represents them will be awarded to the winner of the tournament. Participants must leave all chips in open view of other players and tournament officials at all times, keeping their higher denomination chips in front. The only exceptions are the chips earned from bounties. Bounties earned will be $25 value chips and the players may take them off the table, since these chips will not be in play during the tournament. Chips cannot be transferred. All forfeited chips will be returned to tournament officials . Tournament officials reserve the right to call time and stop play .